This actually IS the Pro-ject P1. All, what Mr. Lichtenberger from Pro-ject has really done with NC 500 to make it P1, was a bit of a cosmetic downgrade, to lower the production costs and a better cabling. All the construction parts except the different tonearm and signal cabling are identical. 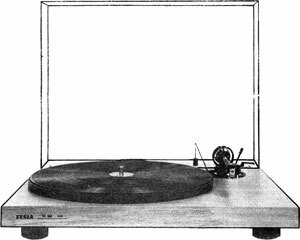 Tesla NC500 is the daddy of the Pro-ject turntables and there are many similarities between them. Few years ago I decided to buy Debut Carbon with the stupid hope that it will be upgrade on something already good just to find that Project replaced some parts with cheaper lower quality components. The Tesla platter is heavier and more solid steel, less ringing than the Debut one. The thick rubber mat is replaced with rediculous felt junk. The Tesla bearing is now reserved for higher class Projects... There is no sign of the famous Debut motor hum, what's more now Project sells upgrade kit for it that is nothing more than the original Tesla solution :) The tonearm is less resonant and you cannot hear it with amplifier switched off unlike the carbon arm, audible across the room. The only drawback is the light counterweight, limiting the cartridge choice. If the paid reviews rate Projects as good turntable, then Tesla NC 500 is very, very good.